Payvand.com - After 40 years, a never-before-heard recording of the Farah Choir, which was supported by the former queen of Persia Farah Diba (Pahlavi), has been released in Europe. The release of the recording, which contains seven Persian folk songs, was planned for 1978, but was halted due to the Islamic Revolution. "In 1973, Farah Pahlavi Charity Foundation commissioned Evlin Baghcheban to establish a conservatory of music in Tehran for orphan children. In this school, Ms. Baghcheban organized a choral group called the Farah Choir," musician and documentary maker Pejman Akbarzadeh stated. "In the years before the fall of the monarchy Farah Choir gave regular concerts throughout the country." For its debut album, in 1978, Farah Choir in Vienna recorded seven folk songs from the provinces of Bakhtari, Lorestan, Mazandaran, and Pars. The songs were arranged by Ruben (Rubik) Gregorian and Samin Baghcheban especially for the choir. "By the time the recording was finished in Austria, Persia was in turmoil with the revolution that brought Islamists to power, and all musical activity, including the Farah Conservatory and its choir, was shut down," Pejman Akbarzadeh added. The recording in Vienna was neglected until the summer of 2010, when Evlin Baghcheban, just months before her death, passed on the materials to Pejman Akbarzadeh who was working to preserve the Baghchebans' musical heritage. The old recordings, under his supervision, has been restored and released in the Netherlands. Recently in an interview, Queen Farah said, "I am delighted that the recording still exists. We created this choir to mentally support the orphan children, but within few years, following the efforts of Evlin Baghcheban, it became a professional choral group which was dispatched to Austria for recording projects as well." 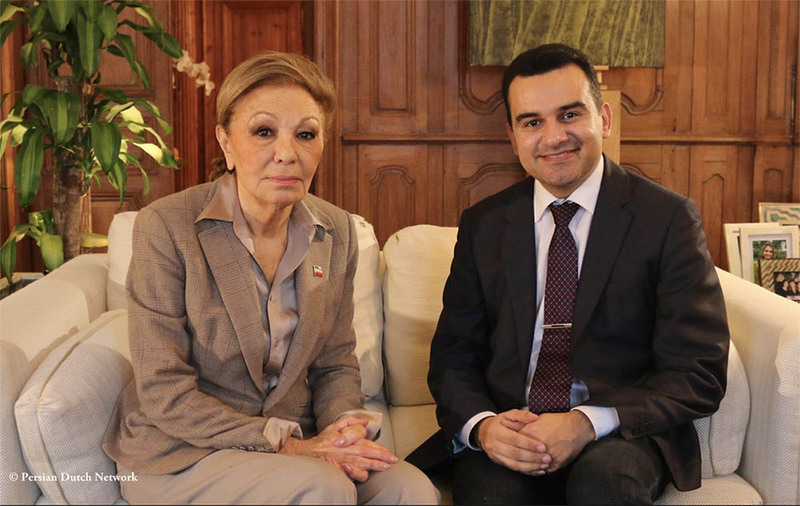 Queen Farah Pahlavi and Pejman Akbarzadeh, Paris, January 2018. 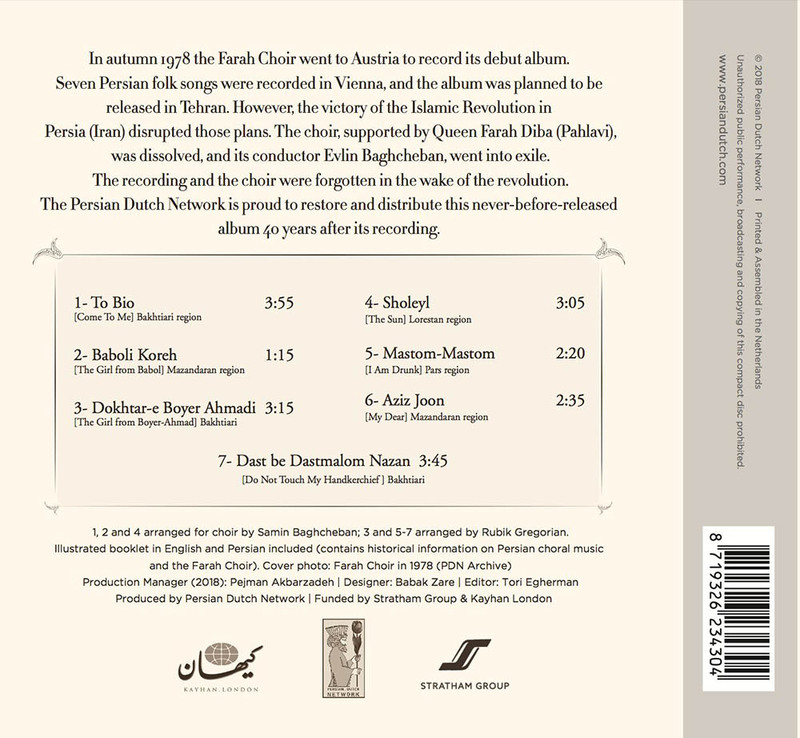 The Persian Dutch Network is distributing the album internationally. The 2018 production is funded by the Stratham Group and Kayhan London. 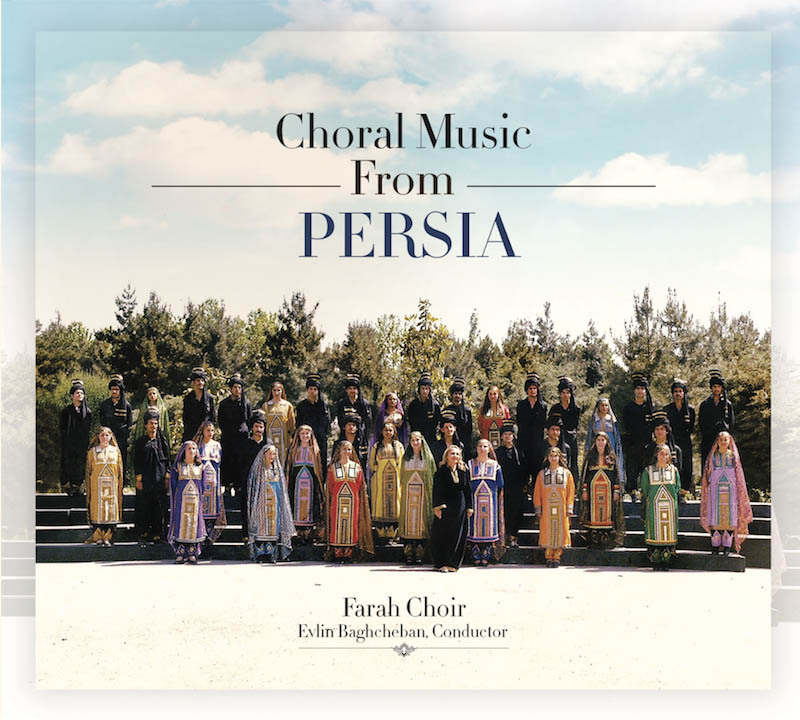 The CD is accompanied by a bilingual booklet which contains historical information on Persian choral music and rare photos of the Farah Choir.